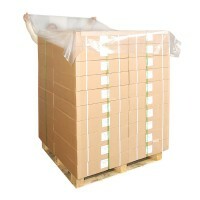 Plastic/Polythene Products- Campbell International Specialist Tapes. Polythene Self Seal Envelopes / Bags / Polybags Not suitable for food use. Excellent for magazine mailing.Size: 255 x 330mm with 40mm Flap, 50 micron thick polytheneQuantity: 1000.. Size: 500mm x 200m x 25micronDescription: Strong and black film: sticky only to itself to prevent products on pallets from moving while in transit. ..